NBC remade Casablanca into a weekly 1983 series starring David Soul. In that context, reprising the story of Clyde Barrow and Bonnie Parker is barely a hand-slap misdemeanor. Besides, it’s been done before. 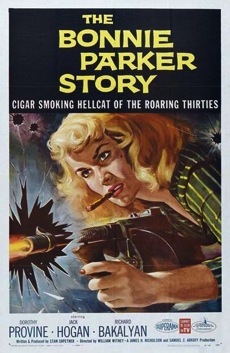 The landmark 1967 Bonnie and Clyde, ranked 27th on the American Film Institute’s 100 greatest movies, came a decade after 1957’s The Bonnie Parker Story (“Cigar Smoking Hellcat of the Roaring Thirties”). And in 1992 Fox followed up on the famed Warren Beatty/Faye Dunaway version with Bonnie and Clyde: The True Story, starring Dana Ashbrook and Tracey Needham. It wasn’t very good. Now it’s three networks’ turn -- and at twice the length. Bonnie & Clyde, being simulcast Sunday and Monday nights on Lifetime, A&E and History, is four hours worth of factual and fabricated history. But its predecessors also played around with the “real truth,” which has been highly elusive ever since the title characters met their ends on May 23, 1934. 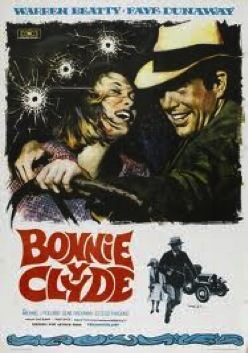 Bonnie & Clyde is directed by the still well-regarded Bruce Beresford (Breaker Morant, Tender Mercies, Driving Miss Daisy). And its producers are Craig Zadan and Neil Meron, whose credits range from TV’s Smash and Life with Judy Garland to the big screen’s Chicago and The Bucket List. Bonnie & Clyde begins at the end -- which is the usual approach in contemporary docudramas. “I’ve always loved you, Bonnie,” says Clyde before their last roadster is riddled with dozens if not hundreds of bullets. Soon comes the narrative flashback, which in this case goes quite a ways back. Clyde was a sickly little boy who almost died from a fever at age 9. His older brother Buck (played as an adult by Lane Garrison) is the architect of their early crimes, beginning with chicken-stealing. But momma Cummie Barrow (Dale Dickey) has faith in her youngest son’s basic goodness. “You ain’t just smart. You got a good heart,” she tells Clyde. Hey, Gummie made a rhyme. Publicity materials say that Clyde was “rumored to have the power of second sight to see events before they really happened.” Some flimsy newspaper accounts from those times speculated on such powers. But Bonnie & Clyde takes them to the bank, repeatedly infusing these proceedings with ominous flash-forwards while also enabling Clyde to see Bonnie loping toward him in a shimmering white dress well before they hook up. It does make for some purdy images. The young gun stars of Bonnie & Clyde, which also include Modern Family’s Sarah Hyland as Buck’s dipsy bride Blanche, are aided by two ring-wise vets with Oscars under their belts. Holly Hunter doesn’t make all that much of an impression as Bonnie’s doting mother, Emma. But William Hurt instantly resonates as flinty, retired Texas Ranger Frank Hamer, who’s taken down a lot of bad guys in his day and is rejuvenated by the challenge of catching Bonnie and Clyde. Hurt’s Hamer, who comes to the fore in Monday’s Part 2, has a way with words and glowers. Nothing’s more gratifying, he tells fellow lawman Ted Hinton (Austin Hebert), than putting bullets in the heads of those who deserve ‘em. He also enjoys upbraiding “Fort Worth Herald” reporter P.J. Lane (Elizabeth Reaser), who’s made a name for herself by glamorizing the bank-robbing exploits of Bonnie and Clyde during the Depression era. Perhaps informants would be more willing to step forward if Lane hadn’t turned her subjects into “Garbo and Gable,” Hamer growls before producing a warrant requiring her to turn over some publicity photos sent directly her way by Bonnie and Clyde. The Beatty/Dunaway Bonnie and Clyde strongly implied that he fired blanks in the bedroom. In this remake, Bonnie wears the pants when it comes to egging Clyde on to bigger and better-publicized robberies, a number of which occurred in Texas. But Clyde is no slouch in the sack, even after being raped by a male inmate and then viciously beaten by guards during his incarceration in a very down and dirty Texas prison. Grainger’s willful Bonnie, invariably in full makeup and resembling a younger Drew Barrymore, gets the better of co-star Hirsch in terms of selling her character. Her dragon lady cred begins kicking in near the start of Part 2, when she lobbies for showier exploits. After all, she’s always wanted to be a star, at least for the purposes of this re-telling. “If we pull big guns on people, they’re gonna do exactly what we tell ‘em, to,” Bonnie reasons. OK, she says. “Just a thought. Sorry I had one.” He laughs agreeably, and in the next scene they’re amassing bigger guns. But in the end, are we to believe that Clyde had a death wish for the both of them -- and acted on it? Although it’s now the heart of TV’s fluff-filled Christmas season, this is all likely to play quite well in terms of ratings success for Lifetime, A&E and History. The latter network scored big last year with its Hatfields & McCoys miniseries. And the combined audience for Bonnie & Clyde may well approach the average of nearly 14 million viewers for the three-part H&McC. Part 2 of Bonnie & Clyde, with its blood-soaked death scene played out at full length, almost assuredly will be the bigger draw. Better yet, Hurt becomes an equal partner in the proceedings. Or to put it another way, his standout take-no-prisoners performance reduces the younger cast members to comparative kids in a playpen. Hirsch and particularly Grainger are gamers, though, even if they’re not in the same league. The Beatty/Dunaway pairing remains enshrined, of course. Still, this elongated version makes its own mark, although certainly not an indelible one. To which Bonnie supposedly would say, “More, more!” And surely there will be.